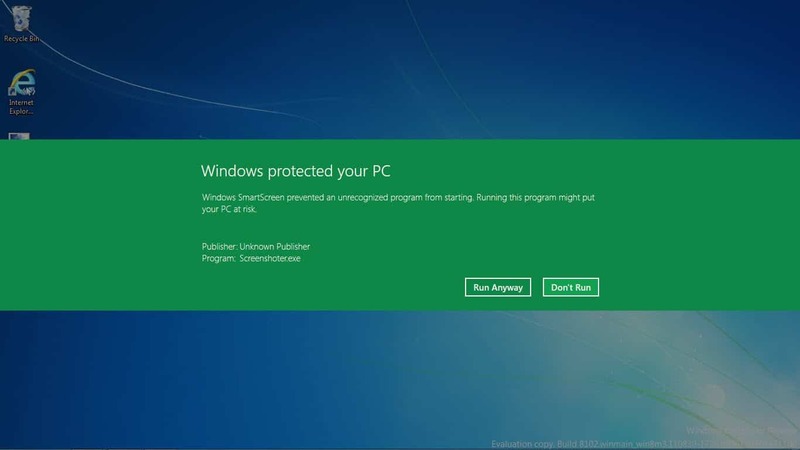 Microsoft's operating systems Windows 8 and Windows 10 include a security feature called Windows SmartScreen that is enabled by default. SmartScreen is a background service that monitors the execution of applications and the opening of sites on the system to block the execution of application or the loading of sites until the resources have been checked by the service. SmartScreen collects information about the program, including the program's file name, hash code and digital signature if available, and submits the information to a Microsoft server on the Internet (https://apprep.smartscreen.microsoft.com). 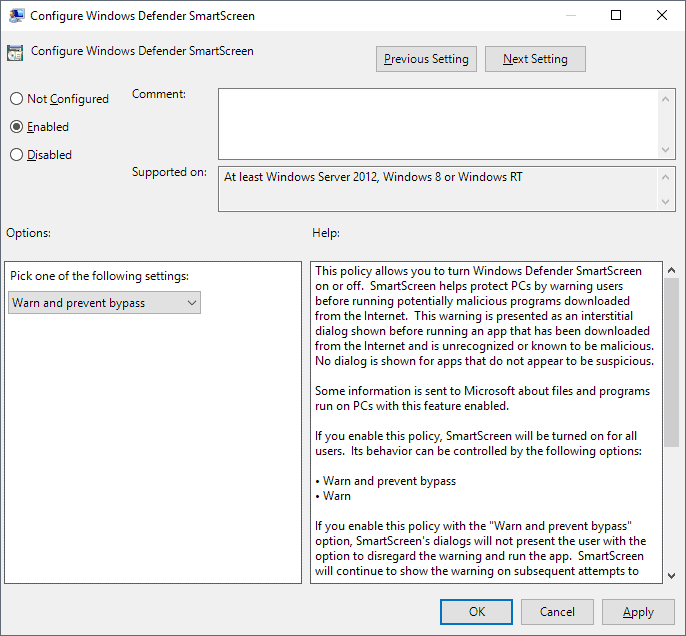 The server responds with a rating for the application that either triggers Windows SmartScreen if there is no rating or if the rating is low, or it lets you continue with the program installation or opening of the site if the application or site is considered safe. 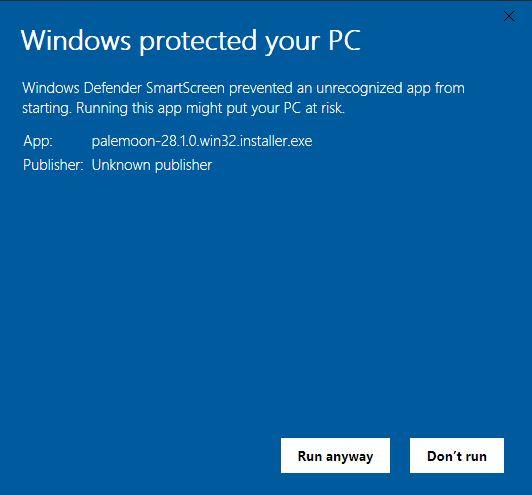 The SmartScreen message that appears displays Windows protected your PC on the screen. Users need to interact with the prompt but the way the prompt is designed makes that difficult as it only displays "ok" on the first screen that opens. The OK button is highlighted in the window but ok simply stops the execution of the program. While that is certainly sometimes desirable, especially if you suspect the software to be malicious in nature, it is problematic if you are sure that this is not the case this time. So, how do you bypass Windows protected your PC? It is necessary to click on the more info link underneath the description to bypass the Windows protected your PC SmartScreen message. You need to select "run anyway" then to run the program on the system. If you don't want to run it, select "don't run" instead. If you are an experienced user, you may not like the SmartScreen protection at all as it slows you down and may not provide additional security at all, especially if you are running up to date antivirus software on your system. There are two options to turn off Windows SmartScreen in Windows 8. I already described one of the options in the article that mentioned that SmartScreen reports back to Microsoft. This option is however only available if you select a custom installation. If Windows 8 is already installed, it won't do you any good. 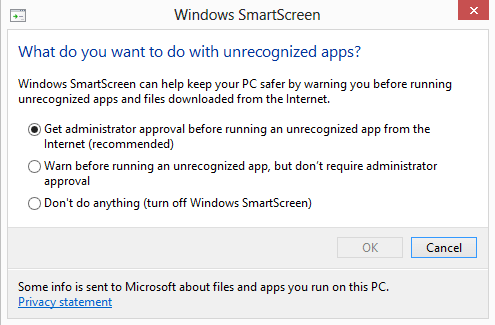 SmartScreen is part of Windows 10 as well, and you may still disable the feature if you don't require it. Note that disabling it may reduce the protection of the PC; I suggest you do so only if you run into issues caused by it and/or use software that adds similar security functionality to the operating system. Microsoft removed the Control Panel option to manage SmartScreen in recent versions of Windows 10. You can still turn it off but need a professional version of Windows 10, e.g. Windows 10 Pro or Enterprise for the first method as youou need to use the Group Policy Editor for that. Note that the Group Policy option does not allow you to disable SmartScreen. You need to change a value in the Registry instead. If you want to do so, skip this part and jump right to the next instead as it offers instructions on how to do that. Tap on the Windows-key to display the Start menu. Type gpedit.msc and select the result (it may be called Group Policy Editor or gpedit.msc). Set it to warn only. The only two states you can set SmartScreen to are "warn and prevent" or "warn". The default is warn and prevent and it won't show options to bypass the warning. If you want that option, you need to switch the policy to warn instead. Tap on the Windows key to open the Start menu. Type regedit.exe and select the result. Set the value to 0 to disable SmartScreen, to 1 to give users warnings, and to 2 to require admin approval. The default is 1. Restart the PC after you made the change. Tip: you can disable the SmartScreen Filter that Internet Explorer and Microsoft Edge use as well. In Internet Explorer, go to Tools > Internet Options > Advanced and uncheck the "Enable SmartScreen Filter2 option near the bottom of the listing. In Microsoft Edge, click on Menu, the Settings > Advanced Settings, and toggle the "Help protect me from malicious sites and downloads with Windows Defender SmartScreen" so that it reads off. Make sure you are on the desktop. If you are not, press the Windows key. Select Settings > Control Panel from the menu. Select System and Security and on the next page Action Center. Click on the Change Windows SmartScreen settings link on the left sidebar. Warn before running an unrecognized app, but don't require administrator approval. Don't do anything (turn off Windows SmartScreen). The third option turns off the feature completely so that you do not see the Windows protected your PC messages anymore when you run unrecognized applications on your operating system. There is a faster way to go to the setting. Press Windows-W to open the Settings search app on the start screen. Enter smartscreen here and select the only option that pops ups (Change SmartScreen settings). This opens the Action Center control panel applet from where you can select to change SmartScreen options on the left. Find out how to disable the annoying "Windows protected your PC" prompts that Windows throws whenever SmartScreen Filter kicks in. I didn’t understand the title “Turn off Windows protected your PC” and assumed a mistake. Turn off “Windows protected your PC”. Turn off Windows protected your PC messages. I’m not sure if it’s just me, that found it difficult to get right away. Yeah it is confusing, sorry for that. In my computer there is no Enable Smart Screen option.